Meet May sponsors + lovelies. May is coming to a close in a few days and I wanted to share with you the lovely people who make my blog a little brighter. If you don't know them, I suggest you hop over to their blogs and take a gander. A special thank you to all my sponsors, lovely friends and people I truly admire. Thank YOU! One Thing I'm Loving Right Now? This dress... I can't wait until it's available! Hello there. I'm Mary. 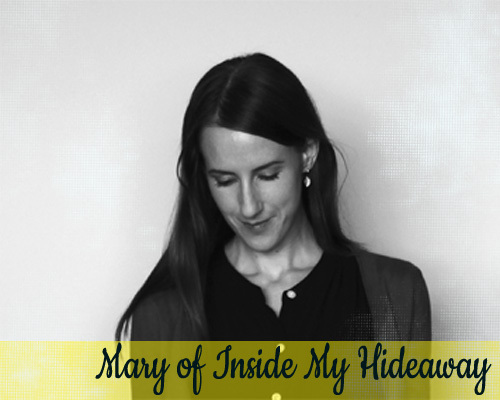 Inside My Hideaway is where I blog about art, inspiration, music, handmade, diy crafts, and anything else that makes me smile. I also make cute felt accessories and illustrated journals for my Etsy shop, My Hideaway, and I will be adding some new artwork soon! When I'm not blogging or Etsy-ing, I love to read novels, watch old classic movies and British crime series, and obsessively check the websites of local pet rescues--I really want to adopt a dog! Oh and nice to meet you. These cat shoes are the cutest and completely handmade. I recently became an Independent Stylist for Stella & Dot to help indulge my accessory addiction and help style others to look their best. My latest obsessions are the fabulous Bahari Statement Necklace and any (or all) of their bracelets stacked together. 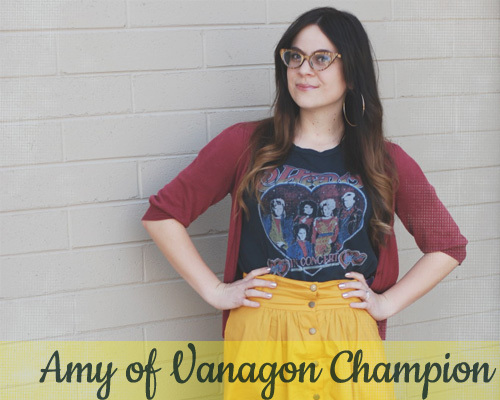 Meet Amy of Vanagon Champion. I first adored her and then her adorable Westie van! What does Amy have to say about herself? I'm a voracious thrifter, music aficionado, heathen, and owner of a 1984 Westfalia Vanagon. I'm a writer and a designer, but mostly just a secret cat lady. Vanagon Champion is about all of these things with a little bit of thrifty goodness and old-fashioned magic for good measure. Oh hi, I'm em! 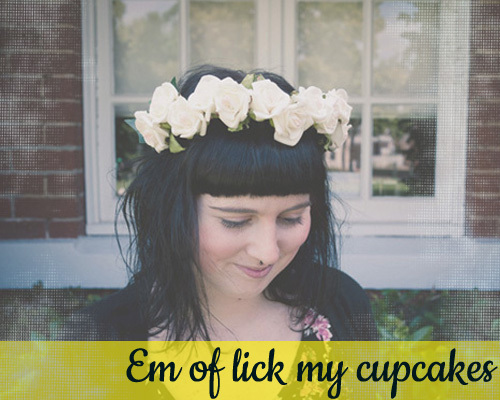 I live over at lickmycupcakes. On my blog you'll find I am a baker, a crafter, an iPhone-Photographer. 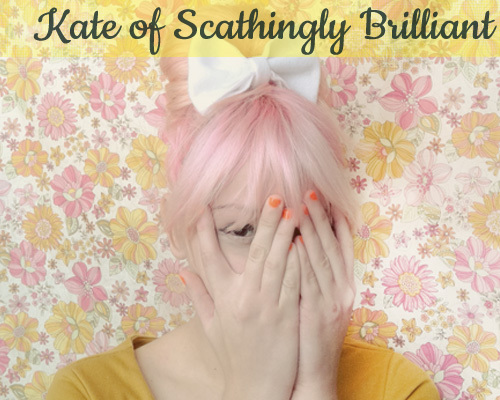 An occassional jewellery maker, plastic dinosaur collector & doodler. I like fluffy pink things & spiky glinty things. I like Buttercream frosting & I like blood. I dress like a doll & swear like a sailor. I like you! Right now I'm obsessed with this space donuts blouse from Drop Dead. I'm actually really not sure why I don't already own it..
Gussy is the owner & designer of Gussy Sews, a lifestyle blog and a ruffled accessories boutique. On her blog you'll find tips on how she left her day job to focus solely on her business, different projects that help build a handmade community, and shop updates on her designs. 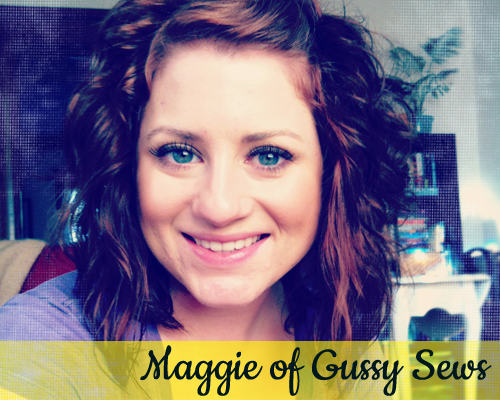 Gussy's had her work featured in magazines such as Pregnancy & Newborn, Simply Handmade, and OK!. That rounds out all of the sponsors + lovelies! Hope you've found some new friends to check out! I hope you're all enjoying your Memorial day and remembering those we've lost. 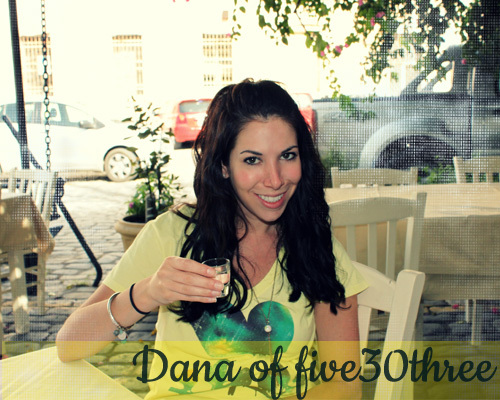 Thanks so much for sharing a bit about me with your readers, Rachel! I can't wait to meet all these other beautiful, talented and stylish ladies! @Dana, you're welcome dear lady! So glad to have you! @Em, everyone is amazing! :) Thank you lady!